To add a connection, click the [+] icon to the right of the MySQL Connections title on the home screen. This opens the Setup New Connection form, as the following figure shows. 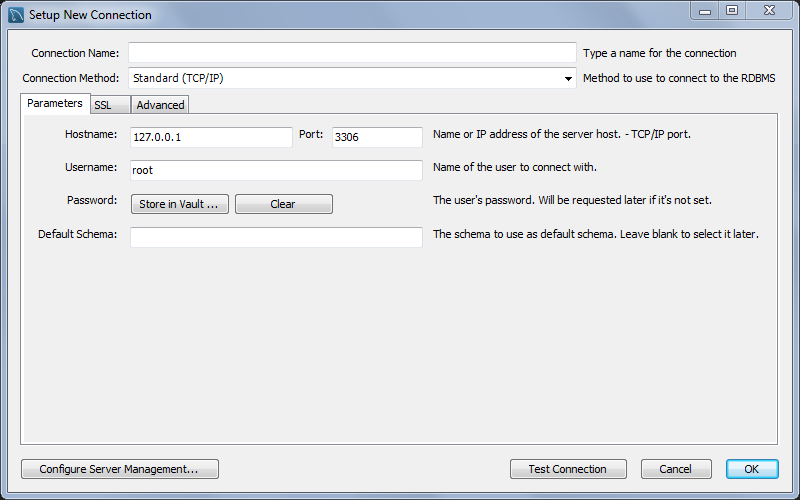 The Configure Server Management button (bottom left) opens an optional configuration wizard for setting shell commands on the host. For example, commands to start/stop the MySQL instance, or to edit configuration file. For more information, see Section 5.3.7, “Configure Server Management Wizard”. Fill out the connection details and optionally click Configure Server Management to execute the Server Management wizard. Click OK to save the connection. When opening connections, MySQL Workbench automatically sets the client character set to utf8. Manually changing the client character set, such as using SET NAMES ..., may cause MySQL Workbench to not correctly display the characters. For additional information about client character sets, see Connection Character Sets and Collations. New MySQL connections are added to the home screen as a tile, and the Section 8.2.1, “Object Browser and Editor Navigator” describes several MySQL Workbench features to monitor and configure each connected MySQL server. A single MySQL Workbench instance can open one or multiple MySQL connections into individual tabs. For a more detailed overview of this process, see the tutorial titled Section 5.2, “Creating A New MySQL Connection (Tutorial)”. I had an error connecting to my local MySQL instance "Failed to Start SSH Tunnel". Fixed by installing missing Python packages. In my case only package paramiko was missing, I figured the pycrypto package was installed by Anaconda.